Flexible rapid self-repairing roll-up door typology DYNAMICROLL® SUPERMARKET in stainless steel AISI 304 is the base of dynamicroll® especially converted in compliance with regulatory requirements of companies operating in the field of supermarket. Through the special rapid door for food business You get a wonderful product in industrial environments where You should get the minimum requirements of hygiene and protection of unauthorized personnel, as for example supermaket. Roll-up door dynamicroll® supermarket can be provided on request in stainless steel material, easy to clean and resistant to oxidation, or in galvanized steel. Since it is quite likely that in the area next to the door we can find unauthorized and untrained customers, we remind You that BMPgroup doors provide great security. 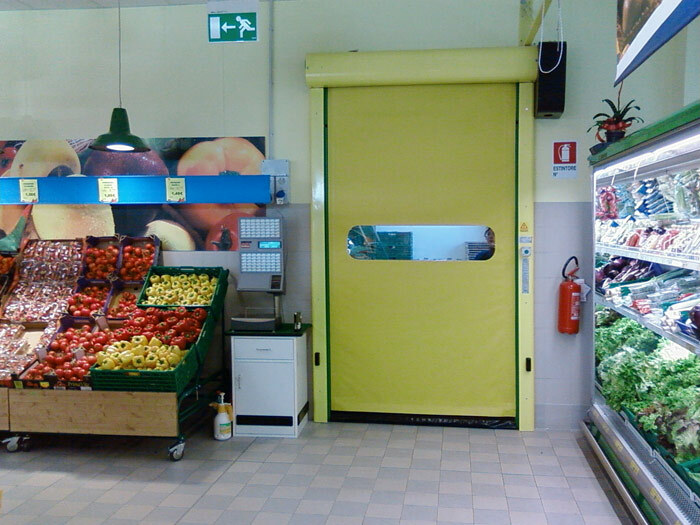 Dynamicroll® supermarket door is equipped with powerful engines capable of opening and closing the door very quickly, and especially in great security, thanks to a security monitoring system with a photocell out of the cloth. B.M.P.group provides a Great product in Great security. Contact us for more information. – Rapid self-repairing doors type dynamicroll® SUPERMARKET, suitable for max size 6000 x 5000 h curtain closing in PVC without rigid elements for indoor use. – Rapid flexible doors in pvc type dynamicroll® SUPERMARKET INOX, suitable for max size 6000 x 5000 h curtain closing in PVC without rigid elements for outdoor use.